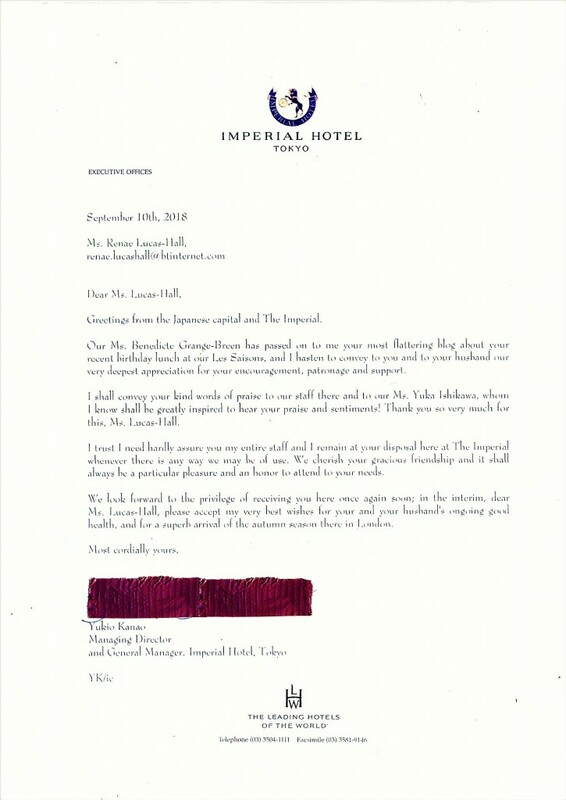 This week, I felt deeply honoured when I received this beautifully written letter from the Managing Director and General Manager of the Imperial Hotel in Tokyo, Mr Yukio Kanao, thanking me for my most recent blog post. If you’re planning a trip to Tokyo, you should definitely consider staying a few nights in a luxurious room or spending a few hours dining in one of the magnificent restaurants at The Imperial, Tokyo’s most prestigious hotel. You’ll certainly be in good company. A noteworthy fact is that Princess Sayako (the third child and only daughter of Emperor Akihito and Empress Michiko of Japan) held her wedding ceremony to Yoshiki Kuroda at this hotel in 2005. “A rarefied combination of East and West, the Imperial Hotel’s stately buildings are within close distance of virtually everything important in Tokyo. Only a short walk away are the fabled delights of the elegant Ginza, Tokyo’s centre for high fashion; the central business district of Marunouchi, where international transactions by the world’s leading companies occur every day; Japan’s government offices in Kasumigaseki and the nearby Diet; and the tranquil gardens of Hibiya Park and the Imperial Palace.